Malaga is one of the most accessible Spanish cities by air, land and sea. You just have to choose the means of transport that best suits your preferences in order to discover one of the most charming cities in the Mediterranean. Come out and enjoy Malaga, let it surprise you with all the options that this maritime city offers and discover in just 24 hours all the wonders hidden in the city of Picasso and María Zambrano. Enjoying the first and most important meal of the day in Malaga can be an experience in itself. If you want to start the day like a local, you must order a ‘pitufo’, a small sandwich, filled to taste. This word literally means ‘smurf’ and refers to the small size of its bread loaves. You can try it at El Pimpi whilst enjoying the view of the Arab Fortress and the Roman Theatre. Besides, in Malaga we have a unique way of ordering coffee, which is related to the amount of milk and coffee used. You can have your coffee without milk, half and half ‘un mitad’, or with more milk than coffee ‘un sombra’ or only a splash of coffee to your milk ‘una nube’. You can taste different coffee types at the Café Central, in the central Plaza de la Constitución. And if you prefer to start your day with something sweet, we recommend trying the traditional ‘churros’ with hot chocolate at Casa Aranda. With our bellies full, it is time for sightseeing. The Arab Fortress, the Roman Theatre, the Gibralfaro Castle and the Cathedral of Malaga are monuments you should not miss. A nice way to start your day visit in Malaga is to walk up to the Gibralfaro Castle, which dates to the Phoenician period and whose outer walls are linked to the Arab fortress. From them, you will get spectacular views of the city and you can visit the Interpretation Centre to discover the site's history. Another stop would be the Arab Fortress, which is often referred to as the ‘Alhambra’ of Malaga. This fortress palace dates back to the Muslim period and was built in the XI century. You can take a lift to access it and walk down until you reach the Roman Theatre, to observe Roman, Arab and Renaissance culture at the very heart of the city. You still have time to visit the Cathedral, commonly known as `La Manquita’, since it is unfinished and lacks coping on the main façade and the south tower. It is possible to book guided tours to discover the fascinating details about the construction of this architectural jewel, which was built during the XVI century. Just before lunch, it is time to relax and take a walk through the historical centre of the city. There are some streets which stand out for their beauty: calle Císter y calle San Agustín (close to the cathedral) and of course the iconic calle Larios, Malaga’s high street. 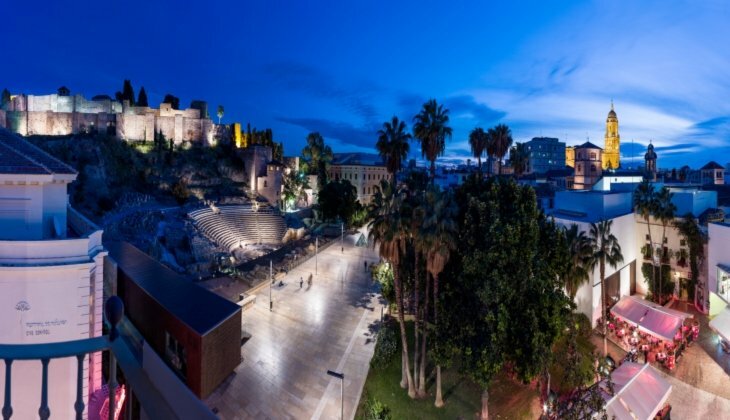 Amongst all the monuments and places of interest that you will see as you walk through the historical centre of Málaga, we highly recommend to take a good look at the plaza del Obispo (Bishop’s Square) where the beautiful Palacio Arzobispal stands, la iglesia de San Agustín (The Church of San Agustín) la torre mudéjar de la iglesia de Santiago or the churches of San Juan y de los Mártires. Having said this, your visit to the historical centre of Malaga will still not be complete until you wander around the narrow streets which lead to the well-known Pasaje de Chinitas, one of the most charming spots in the city centre. This passage and its arabic-style narrow streets are very popular due to the many restaurants and terraces that can be found in it. In that same spot, until 1937 there was the Chinitas Café which was brought to light by one of García Lorca poems. It is, without doubt, a great place to enjoy some tapas, as well as other typical Malaga restaurants such as ‘La casa del Guardia’ o ‘La Campana’. The gastronomic options are endless, but we would like to highlight the ‘Mesón Santiago’, ‘Mesón Antonio’, or any of the restaurants which specialise in fried fish in the maritime neighbourhood of Pedregalejo. On our way to a nice restaurant after our tour, we walk past the ‘Mercado de Atarazanas’, the local market and one of the finest examples of nineteenth-century architecture in Málaga. The building dates back to the XIV century, when it was used as a shipyard in the days of the Nasrid dynasty. After the Reconquista, it served as a warehouse, a magazine, a military hospital and barracks. Some traditional dishes you should try are the ‘porra antequerana’ (similar to the salmorejo, which is a cold tomato soup), 'berenjenas con miel' (deep fried aubergines with cane honey) or the 'flamenquín' (deep fried ham and cheese rolls). Another way to get to know about a city is to visit its museums: some you should not miss are the Picasso Museum, the Picasso Birthplace Museum, the Thyssen Museum, the Museum of Malaga or the Pompidou Centre. For the contemporary art lovers, the Pompidou Centre is a unique experience: Frida Kahlo, Magritte, Bacon, Miró or Tápies are just some of the artists whose works are exhibited in this museum. When the sun comes down and the evening sky lights up in beautiful pinks and blues, it is time for a walk along the beach or in the sand. You can take a picture on the big letters at the beach ‘Playa La Malagueta, as well as admiring the lighthouse ‘La Farola’ at the busy ‘Muelle Uno y el Palmeral de las Sorpresas’, the harbour promenade. To end the day, there is nothing like enjoying the sea breeze, its sound and the atmosphere at the harbour. After a long day of walking and sightseeing, how to resist the delicious smell of the traditional ‘espetos’ (grilled sardines), present in most beach restaurants? You cannot leave the city without tasting them, as they are one of the most symbolic dishes in Malaga, as well as the sweet wine from Malaga. 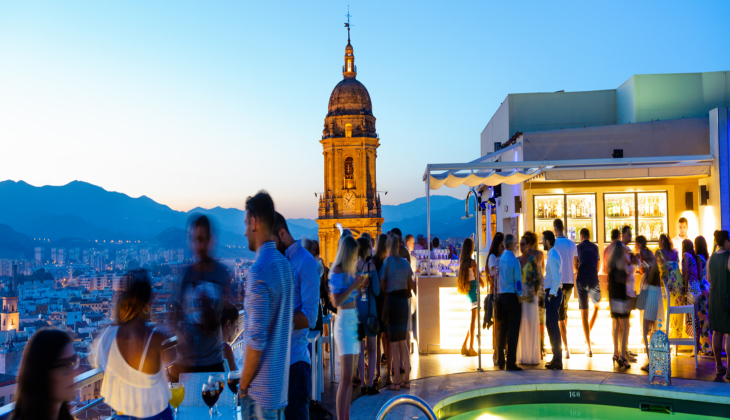 Finally, if you fancy a drink before you leave Malaga, the views of the city are specially rewarding on the terraces of the hotels ‘Molina Lario’ or the ‘Málaga Palacio’.